As many in the Tea Party movement have noted previously, Romney needed to choose someone who could articulate the battles that lie ahead for our nation as well as rally the base toward a Romney victory in 2012. While Ryan has his flaws, as FreedomWorks CEO Matt Kibbe noted, this is a clear sign that the Romney campaign is reaching out to conservatives and the engaged Tea Party grassroots community. 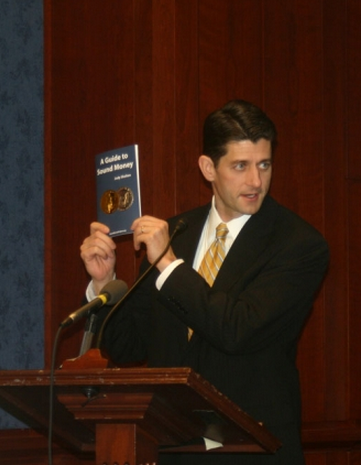 In December 2010, FreedomWorks and the Atlas Forum hosted a Sound Money forum where Congressman Ryan spoke on our fiscal policy and how it is on a collision course with our monetary policy. "There is nothing more insidious that a government can do to its countrymen than to debase its currency, yet this is in fact what is occuring." We believe that going forward we will have an ally in Paul Ryan. He's known as a reformer; someone unafraid to take on the challenges of our unsustainable entitlement growth and our ever expanding federal deficit and national debt. In the past he has supported a flat tax and understands the need for fundamental tax reform as a pathway to a prosperous nation. If you and I don't show up to defend Paul Ryan, expect our best ideas to lose in the political marketplace. There is simply too much at stake to allow that to happen. Will you join us? If you read the commentary linked to this post, Kibbe has many of the same points. This is a bizarre commentary. Ryan voted for and defended Medicare Part D, which was unpaid for. Hell even Obama tried to pay for Obama care. Ryan is a reformer? Is that serious? The Ryan plan says that we will spend $3.6 trillion this year while bringing in $2.4 trillion in FY2012. In contrast, President Obama's budget says that we will shell out $3.8 trillion in FY2012 and bring in $2.5 trillion. If you want to defend conservative ideas, you have to vote for some one that actually believes in them. As pretty much everyone expected, President Obama’s nomination for Federal Reserve chairman is a big-government Keynesian. Many left-wing pundits are applauding the nomination of Janet Yellen, the current Vice Chair of the Board of Governors of the Federal Reserve System. She has held many prominent jobs within the Federal Reserve and politics. Rand Paul Leads Effort to Get Vote on Audit the Fed-- Contact Your Senators! On today’s edition of The FreedomCast, Dean Clancy VP of Public Policy at FreedomWorks joins me to discuss the battle between the Republican and Democrat budgets, what to expect in the process going forward and report live from CPAC, and the latest on BlogCon2013. Have a suggestion for an upcoming FreedomCast episode, or a comment? The debt ceiling debate reached a new level of absurdity when some pundits began tossing around the idea of a $1 trillion coin. Instead of advocating for spending cuts to avoid hitting the $16.4 trillion debt limit, proponents of the one trillion dollar coin believe that the Federal Reserve just needs to create more money. They want the U.S. Throughout the various rounds of quantitative easing enacted by the Federal Reserve in response to a persistently sluggish economy, advocates of loose monetary policy have kept a gleeful eye on the Consumer Price Index, pointing to the lack of measured inflation as evidence for the soundness of their ideas and the groundless paranoia of their detractors. Over the last couple of years, Paul Krugman and The New York Times have championed a bigger stimulus, which equals more government deficits and debt. Recently, another New York Times scribe, Nicholas Kristof, claims Romney's economic plan is equal to the austerity plan of many European counties, particularly Germany and England.